ZOTAC International, a global manufacturer of innovation, is excited to present the game-changing ZOTAC GeForce GTX 1070 Ti Series featuring the advanced gaming GPU based on NVIDIA Pascal architecture. The new and strong line-up includes three different editions – AMP Extreme, AMP Edition, and Mini, all striving for the excellence to deliver next-level gaming performance. The GeForce GTX 1070 Ti AMP EXTREME packs the super-efficient dual blade EKO FANS and the powerful IceStorm cooling to bring temperatures to a chill with the dynamically sized copper heatpipes and massive aluminum heatsink array. Lit with SPECTRA allowing adjustments of three independent zones in various brightness, modes, and colors. It’s all protected with a Carbon EXOARMOR including a front metal shroud and a metal wraparound backplate that provides durable enhanced coverage with style. The GeForce GTX 1070 Ti AMP Edition brings the performance in a much slimmer dual slot and dual fan trim and all color neutral package. The GeForce GTX 1070 Ti MINI comes in at a tiny 211mm (8.3inch) body making it one of the smallest GeForce GTX 1070 Ti graphics card that can fit in 99% of system builds. With a color neutral design and always on white lit LEDs, it’s cooled with an offset 90mm and 100mm fan to enhance airflow and maintain cool operating temperatures while still providing the same GeForce GTX 1070 Ti performance coming from any of the larger sized variants. 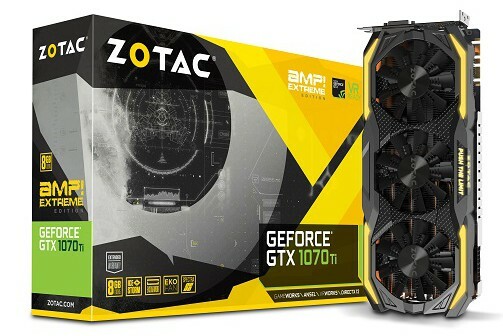 New to the ZOTAC GeForce GTX 1070 Ti Series is the One Click OC button available on the latest version of the Firestorm utility. Go from quick out of the box performance to AMP’d levels in just a simple one click.